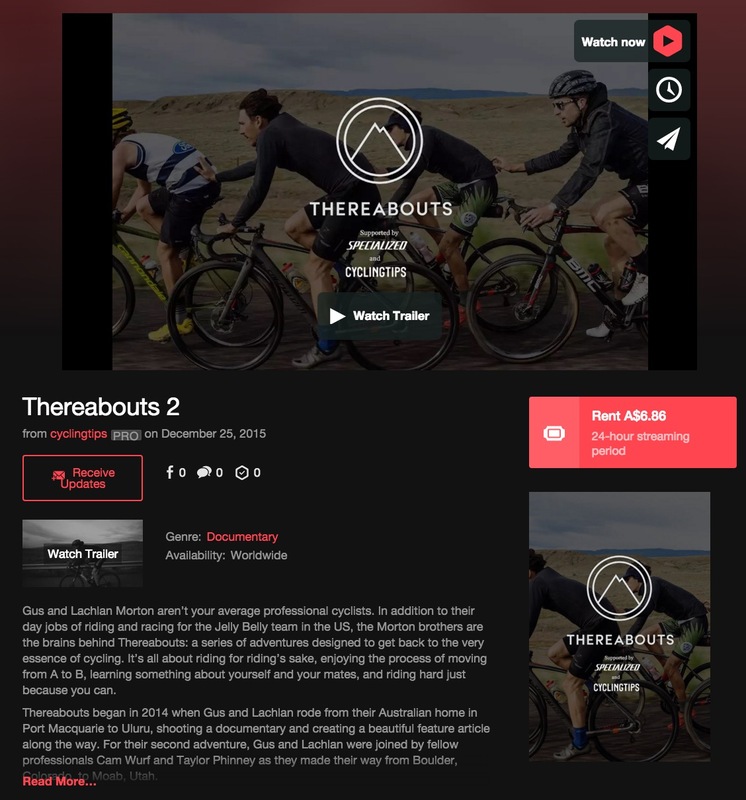 For those of you who missed the 24hr pre-screening of Thereabouts 2, you can now see it on Vimeo on Demand for a small donation that will go towards the making of next year’s Thereabouts 3 sequel. Just click play then “Watch Now” in the top right corner of the trailer. If you haven’t seen the original ‘Thereabouts’ you can view it for free here. If you want to see all the other stories related to Thereabouts that we’ve published, click here. Gus and Lachlan Morton aren’t your average professional cyclists. In addition to their day jobs of riding and racing for the Jelly Belly team in the US, the Morton brothers are the brains behind Thereabouts: a series of adventures designed to get back to the very essence of cycling. It’s all about riding for riding’s sake, enjoying the process of moving from A to B, learning something about yourself and your mates, and riding hard just because you can. Thereabouts began in 2014 when Gus and Lachlan rode from their Australian home in Port Macquarie to Uluru, shooting a documentary and creating a beautiful feature article along the way. For their second adventure, Gus and Lachlan were joined by fellow professionals Cam Wurf and Taylor Phinney as they made their way from Boulder, Colorado, to Moab, Utah. Back in June the quartet wrote about their adventure and shared a bunch of fantastic photos. Now, six months on, the story continues with an hour-long documentary about the trip. In this honest and unguarded film Gus, Lachlan, Cam and Taylor reveal sides to themselves that are rarely seen publicly. For Cam Wurf, joining Thereabouts is an opportunity to remember the bonds that cycling allows riders to form with one another. For Taylor Phinney the trip formed part of the long recovery from a devastating and much-publicised leg injury. Phinney’s candour about dealing with the injury is memorable and commendable, as too his take on the cycling media and the role of cyclists in the media cycle. Many thanks CT – appreciate the opportunity to have watched this one. Credit to the Morton brothers for making an interesting and enjoyable film. The portrayal of the US country side was great – well shot. Would love to spin on some of those roads! Also gave a new appreciation for Taylor and Cam as athletes – Taylor’s comments on the requirement for pro cyclists to conform and Cam’s on fitting in were insightful. It’s good. Very good. Thanks for bringing it to us CT and to those guys for sharing their stories. Inspired to ride and explore beyond the normal routes. Looks terrific. But those show times listed above are not accurate. According to those, I shouldn’t be viewing this now, but I am. Yep, we had a few issues getting the video up + with the timing. But the video will still only be available for a day or so, so we recommend watching it while you can! Ohh…. so good. Loved that drone shot at the end . Just blown away ! “It’s all about riding for riding’s sake, enjoying the process of moving from A to B, learning something about yourself and your mates, and riding hard just because you can.” Exactly. My god he wrote 45km/h on a flat tire for 30km+++ that’s crazy. But never buying that tire or wheel combo ever now haha. Great film. Thanks for showing it. is this only to be seen in AUS, UK and USA? Cos all I see is black, but the audio is there??? Edit: which is saying something because videos are regularly blocked here! Well one thing that I’ve learnt in the first 10mins is that we’ve found out Taylor says “Soccer”funnily, and that’s only one of the many highlights. Awesome vid, great work. Great work by the 4 of them…and Lance! What an awesome adventure, thanks CT.
Flat out genius. If anyone ever needed the reminder of why we cycle, or why the shitstorm that surrounds pro cycling is really of no great importance, this film will deliver. The thoughtful, reflective nature of the protagonists make THIS the cycling film of the year. Really loved it. I feel sad that such a great character in Cam may have left the sport, but appreciated the insight into the personality behind Taylor. Some insight into the Morton’s would have been even better, as we had everyone else including the bar(wo)men! Insight into the Mortons comes in Thereabouts 1. Especially Gus. Beyond awesome, great work guys. Cam Wurf needs his own lifestyle TV show. yes. Good dude always w the positive vibes. Classic flick. I think the message awakens something that is in all of us when it comes to our passion for cycling. Its nice to see someone live it and put it to words. Really inspires me to get out and explore the desert of Arizona. almost the same clearance. Usually, the big difference is in the gear ratio. The gravel bike will have almost the same gear than a traditional road bike. Awesome piece guys, thanks so much for brining this to my attention CT. Awful. just awful. the first was a journey of the soul. this was just a shite club run with Phinney’s ego. Huh. I really don’t see a lot of ego in Phinney. He just seems like a guy. Amazing movie.Thank you for sharing. Bravo….!!! Nice Documental, Nice Pack!! motivational, inspirational, and sensational…!!!! It’s a great piece on where most of us are on our bikes; not training, not racing, but just what you find with friends hanging around on your bikes and going fast enough that the distractions fade. Thank you to all concerned. Awesome doco! Well shot and everything about it wants you to get out and jump on the bike! A little off topic, but something that popped into my head while watching this. As let’s be honest the Morton bros and Taylor haven’t really done it hard financially growing up. Does anyone know if there has ever been a survey or research on the social economical position of cyclists wanting to make it as a Pro? The humble beginnings of cycling from the days of farmer’s sons becoming pros is well gone. Just very interested to know how many in the pro peloton have come from a working class upbringing and the percentage that haven’t. As the sport requires a hell of a lot of time on the bike and a lot can’t do this without financial backing whether it be Mum & Dad or a sponsor. As I see the sport has changed dramatically over the years obviously because of amazing tech advancements, more and more people entering the sport are from a higher income bracket and they are the ones that can afford it. Love to hear some thoughts on that or maybe an article based on the topic CT? I really don’t want to hijack the comments about it, but it just sprung to mind watching this doco. It may have changed in recent times. For European riders, at least, backgrounds were once very much working class. There is no doubt it has changed dramatically. But no one would really want to touch it, as it would be a touchy topic. Loved to see more analysis of it. And if communities and countries that are well below the socio economic level that the current riders are coming from, how this could be changed. Yeah that is an awesome doco! It’s looking at more of this, and less of the pretty boy faux hard luck story. I raced some club races with Taylor’s dad back in 1978 in Pittsburgh. At the time Davis was 19, had no money, was an amateur racer, and sleeping on the couch of his team mate Tom Chew. Back then is when he earned his nickname Cash Register because he would win all the cash primes at races to pay his way to the next race. His only income and support was the money he won from amateur races and a few expenses from sponsors. I’m sure Davis and Connie have instilled in Taylor how fortunate he is to be able to race and earn a living racing his bike. Both Davis and Connie know how hard it was back when they raced. Brilliant! Watched this while prepping my bike for a ride tomorrow. Now I’m thinking of taking a different route and just enjoying what happens during the ride. Very watchable and nice to see they themselves sincerely enjoyed the adventure. Thanks for making it available. As a film, I think the main point being relayed is accomplished with a lot of time to spare. Any sports enthusiast with a modicum of observational skill will have gleaned that professional sport isn’t necessarily a bag of fun. Once you add money to the equation, it can be lot more challenging to the soul and of course the body; cycling isn’t unique in this respect. Amateur sport is no longer ensconced in a protected commune either, with sponsorship creeping in where it can. Ask someone that didn’t fit the AIS mould, whether they found it any easier to achieve the top end of their chosen sport. Whether it was time well spent, when looking back. On the other hand, I can’t help but wonder: do these amount to “first-world” problems? Outside of sport, similar struggles exist and continue until late in life. Part of me wants to say, “awh just htfu boys”, but at the same time I empathise and respect them as athletes. Enjoy the life you have, do what you enjoy. bugger, keep trying it’s pretty damn good! Now it’s available. It’s midnight… F@ck it! No sleep for the dreamers. Pretty good, although I’m confused by the Lance golf bag part. They stayed with him? If so, I can’t understand why they’d tarnish a decent doc about riding with that guy. Seems the antithesis of everything they’re talking about. I’m about 20 minutes in. I’m continually, however, disturbed by the lack of helmets. Wear whatever you want, but why not model safety consciousness with a helmet up top? Otherwise it’s very nice. Was a time that this would have bothered me too. Now I’m more inclined to let it slide. Life’s too short. great movie/vid..awesome scenery and great to see a Davis Phinney cameo too! I stayed up late to watch this superb cycling road trip. Brilliant, honest and so motivational…. Bummer…. I missed it. I guess weekends in Australia start on Friday and end on Saturday. It’s Sunday morning (still the weekend here) in Switzerland and now, no more viewings. Sorry you missed it. We actually extended the viewing for all timezones by about 12hrs. It was never meant to run until Sunday morning in Switzerland. You’ll be able to purchase it soon if you wish to see it. There are a lot of positive comments on here. But for me the first ‘Thereabouts’ was good but this version just failed to do it. Taylor is a very interesting guy and a born racer. I’d love to go for a ride with him one day. Cam is clearly just a machine and the sort of dude you would enjoy having in your group of friends, but in a purely documentary form, this video was boring. There was no real story and I found myself frustrated with the Morton brothers, who are increasingly coming across as arrogant. These short stories have the potential to be incredibly interesting. Perhaps this just went for too long. 30min may have been enough. But then again, the Morton brothers probably don’t care. They did what they wanted to do and clearly had some fun doing it! Compared to first Thereabouts, I had the same impression about Morton brothers watching this. I didn’t think that the guys that I ride with and I could ever be compared to pro’s, but this doco has changed my mind. Every Saturday and Sunday our small group clock up 100 mile rides with no set plan, just exploring the local area, pulling in to cafe’s and bars along the way to refuel and rehydrate (a very loose definition mind you). We have been known to race at times, but we don’t figure in the result sheets much. To be honest we are more concerned with how we look than making the podium, and we do like to use colourful language. In our local area we are more renowned for being bike riders than actually achieving anything on the bike. Hell, a few of us have even ridden flat tyres home because we couldn’t be bothered changing a tube with only 4 mile to go. I’m a lot closer to being a pro than I’d ever imagined. I’d like to buy this rather than rent it. Is buying an option? Indeed. I just changed the settings. You should see the option now.